Data entry for most of the app is straight forward and logical in its design and function. There are really no issues with entering glucose readings, meds, exercise, weight or blood pressure. 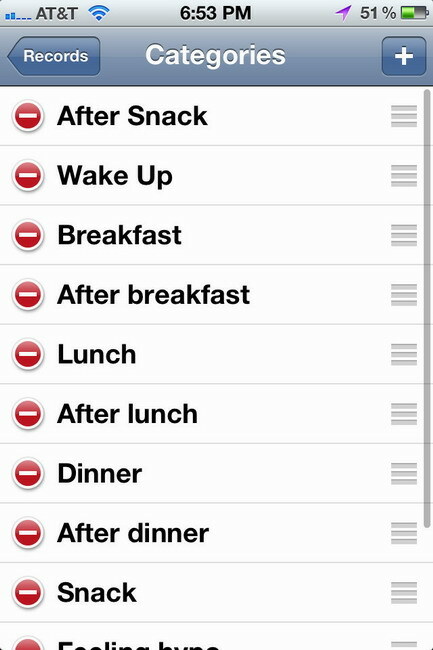 The app comes with the basic time categories or events; Breakfast, After Breakfast, Lunch, and so on. 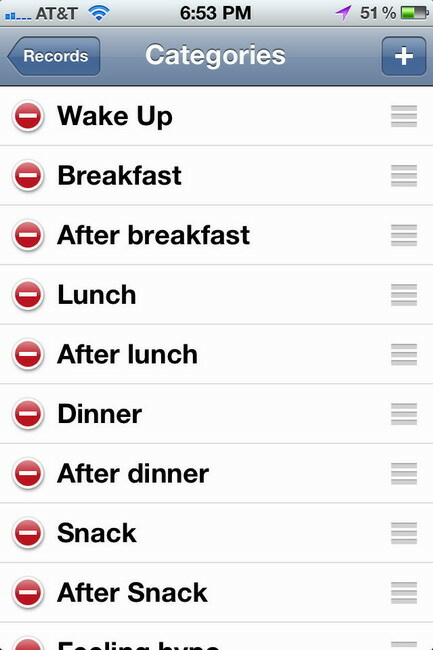 What is special about this app is the ability to customize the categories. You can add, remove, edit categories and even drag them to place them in any order you wish (In edit mode place your finger to the right of the line and drag the category to where you want it.) I am pretty sure this is the only app where you can modify the time categories to this degree. Moving categories is easy. In the series of pictures below a new category "After Snack" needs to be moved to after the existing Snack category. You can add your own meds and exercise tags and they will be added to a spinner for future use. I have some issues with the Meal Logging section. First and foremost is the lack of a bar code scanner. In my opinion any app without a bar code scanner is not worth my time as a Meal Logging Program. I know you need wifi or data plan for a scanner to be beneficial, but I have a wifi network and I want a scanner. For those users without wifi or data plan, I will continue. A big disappointment for me is the food database. I don’t mind navigating down the sub-menus (3 sub menus is common) to find my food items, because I can create meals, save them and reuse them or use favorites and create my own groups and foods. What needs improvement is the food items. Some of the food descriptions are vague and others overly descriptive. Why is there a choice to choose a piece of wheat bread that is toasted? Does toasting change the nutritional information of the bread? To me these are all unnecessary items and only clog the database with items which slow down the process of finding what I what. Perhaps it just me and I am being too tough. What was also frustrating for me was searching for a food item and the results were not logical in a usable way. They were in alphabetical order, but not from the same category of food type. A search for bread returns Abalone, floured or breaded, fried as the first result. I have to scroll down a full page before coming to an item that is actually in a bread category. Even if you navigate to the Yeast Bread category and then search for bread, you still receive the same results. I could not find a way to limit my search to a single category of food. I also came across a number of duplicate folders in the database. When you look under fruits for dried fruits you see another folder for dried fruits in the dried fruits folder. Fruit > Dried Fruits >Dried Fruits. The second dry fruits folder has the same contents of the parent folder. In the Flour and Dry Mixes folder is another folder for Flour and Dry Mixes. I know all these extra folders can be deleted but why should I have too? These things are easily done before selling the software. A comparison of several fast food nutritional charts showed that while much of the data is close enough to give you can accurate idea of what you’re going to eat, there were no servings sizes for many items. Ok, a small fry is a small fry, but the Arby’s section showed Curly Fry with no idea of what size, plus the information in the database did not come close to ANY size listed on Arby’s website. I realize that fast food companies are always changing the actual serving size to make the item look more healthy, but they usually provide the weight of the serving and the Diabetes Pilot Food Database only has serving size information for a few restaurants. In both the PC and iPhone version of Diabetes Pilot you can add new Foods and Groups, thereby creating all your own food groups and food items. I can easily see someone taking the time to customize their own groups and food items, but at $14.99 the Foods database should be better organized. 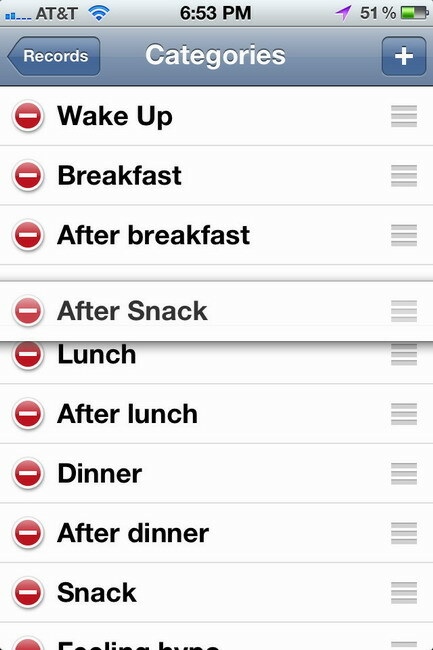 Another option is to delete all the food items and create your own database. You can use either the iPhone app or the PC version and sync. The database design is easy to use and with your own custom groups and food items you have the tools to create a really nice database. Combine that with the ability to use those items to create meals and add to a favorite’s page, there is huge potential for someone to really customize the food database. Although I still want a bar code scanner. In considering the idea of creating my own database noticed that all serving sizes are 1. The actual serving size is what ever the description says 1 represents. 1 cup, 1 - 1 layer cake, 1 oz, 1 half ect.... To adjust the servings size you adjust the 1 to another value. You are limited to 0.0, 0.1, 0.2 all the way to 1, then 1.5, 2, 2.5, 3 and so forth to 10, then whole numbers to 100. A lot of foods today come in single serving size other than a whole unit. 2/3 cup is an example. If I have single serving information in my custom database for 2/3 cup and I want to eat 1/2 a cup, that fraction do I use? All that said, there is an option to do a Quick add food which I used to enter only carbs and called it Food. If you are only interested in tracking carbs or generic food types such as pasta, sweats, beef, bread, ect.. and have the ability to enter the nutritional information you wish to track, then the Quick method should meet your needs. In the settings section you can choose to share your food items. These are uploaded to the app developer for them to use in future updates.